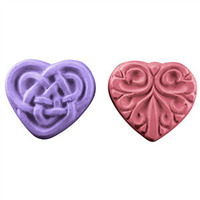 Can’t decide what kind of heart soap you like best? Try them all! 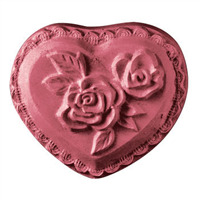 This Hearts Floral Guest Soap Mold offers five beautiful options, including some with vines, flowers, and frames. "I use this for melt and pour soap "
"Fantastic mold, but incorrect weight"
COMMENTS: I am using this mold to make lotion bars, and it is really great. I saw a review saying the mold warps above 110 degrees, but I have been pouring hot beeswax and oils at about 150 degrees with no warping at all. The lotion bars are really easy to unmold! I just turn the mold over, and they fall right out. My only complaint, and it is minor, is that the weight listed for these molds says that the bars are 1.75 ounces. I used that weight measure to formulate my recipe, and ended up with a LOT more bars than I expected. A correct weight for these little molds is about 1.05 ounces, so you may want to take that into account when you are making your calculations. • Weight is incorrectly listed for bars. COMMENTS: I found it difficult to use with M&P because I prefer silicone molds as silicone releases the soap easily. However, It does work well for small bath bombs as the designs are pretty. I package 3 different scents/colors in a cello bag with a pretty ribbon. Gives customers a chance to try multiple scents. These work well for bath melts or lotion bars too. Also nice for samples. COMMENTS: Great little mold for sample size soaps and gift sets, so cute and lovely detail! COMMENTS: I initially purchased this for lotion bars, but have been making cp in them. Very pretty design. Can't wait to purchase some more. COMMENTS: Nice heart design. Slow on release. COMMENTS: This mold makes just the right size guest soaps and bath boms . "Hearts Floral Guest Soap Mold (MW 44)"
COMMENTS: This is the best mold for the little bit of soap left over from my pours. Then I wrap them up for gifts. COMMENTS: This is a nice shape and size to use for our shower fizzing tablets. Thank you! COMMENTS: Used this mold for Valentines themed lotion bars. They unmolded very easily. For packaging I used the 2 oz. tins. If you don't fill the molds until the very top, the bars will just fit into the 2 oz tins (height wise). COMMENTS: Worked great on my lotion bars. Turn the mold upside down and there out. "adorable in a small gift bag!" COMMENTS: I sell a $5 gift bag including a small lotion (amenity 1.65oz set), face pad or loofa, and a clear poly bag with 2 cute soaps. This mold is a great size and shape! The only thing to really be cautious of is the heat at which you pour the melted soap into the mold at. Anything much more than 110*F warps plastic molds. I cut the molds into individual cavities because I make batches of about 3-5 lbs of soap at a time. Have a care for the sharpness of the cut edges, and make sure that there is a 1/3-1/2 inch lip to make popping the soaps out easier, but this way at least makes it easier to pack together a bunch of different molds from a large soap batch onto a cold tray and refrigerate. COMMENTS: Perfect size and great for the bath! "What are the individual finished dimensions of these soaps?" Staff Answer The dimensions are: 2" x 2" x .75"